Do you ever pull out a classic Chandler Bing phrase without thinking? Perhaps you once resonated with the fatherly role of Phillip Banks or long to shop ‘till you drop like his daughter, Hillary? Let’s face it, we often feel like we know many of these iconic characters better than we understand ourselves. In fact, we could probably pin point how they would react in certain situations. So, did we learn anything from those years of watching iconic series like FRIENDS, The Fresh Prince of Bel Air or Frasier? Well, yes, we did actually. 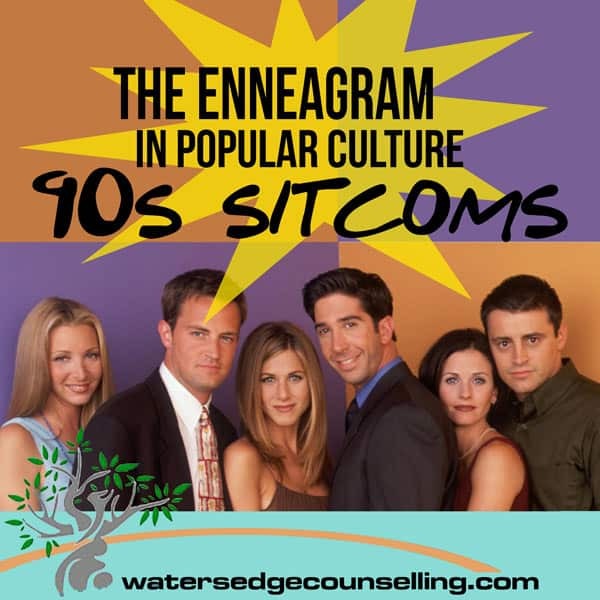 Because these sit coms display the 9 personality types of the Enneagram in a hilarious and heart warming way. In the past we have discussed the traits of each personality type. To make better sense of these types though, we have also categorised the personality types into their motivational centres. There are three—people who are compelled to ‘do’, people driven by their thoughts, and people who are driven by their gut-instinct. In the infographic below, you’ll notice doers vary in personality. This centre contains everything from the nursing instincts of Daphne and Vivian Banks (Type 2’s), to the quirkiness of Will and Frasier Crane (Type 4’s). Doers are compelled to act before they feel or think—yet often, their behaviour stems from an underlying feeling or need. The thinking centre contains the cerebral characters, like Niles Crane (Type 5) and Ross Geller (Type 6). Yet it also possesses the dry wit and loyalty of Geoffrey’s Type 6, and the carefree spirit of Ashley’s Type 7. Lastly, the gut driven centre is built upon instinct. These characters work from their deep need to pursue justice, make peace, or challenge the status quo. Protagonists like Phillip Banks and Marty Crane (both Type 1’s) fit into this group, as well as Chandler Bing (Type 8) with his provocative wit. This category also includes Roz, (Type 9), who is either overwhelmed by her emotions, or in complete denial of them in an attempt to remain neutral. Are you a doer, a thinker or someone driven by gut instinct? Take a look at the characters below and see which ones you best relate to. You never know, you might just learn something about yourself while you pull out those great Carlton dance moves!